Is Physio Marketing Different than Marketing Physical Therapy? Physiotherapy and physical therapy are two terms that continue to grow in popularity throughout the US. And while the technical difference between them is little to none, there’s more to the question: Does it make a difference in your advertising? Is physio marketing different than physical therapy marketing? I already hinted the answer is no – but with a caveat. You see, marketing is about perception. And whether or not the definition is different, the public’s perception often trumps semantics. Physiotherapy and Physical Therapy describe the same health & wellness field. The first term is preferred outside the US while the second is the primary American vernacular. Can we trust what we read on the internet? In this case, yes. 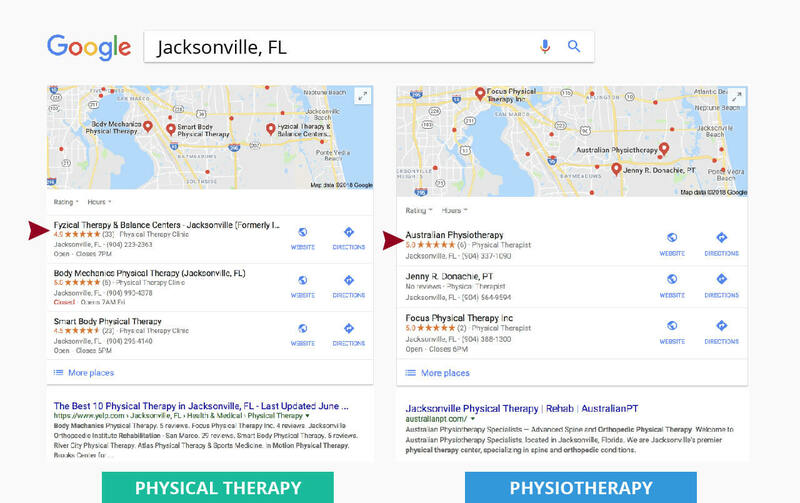 A search for “the difference between physiotherapy and physical therapy” reliably yields articles and featured snippets that tell users there is no real difference. In addition, most search results don’t vary much between the two terms. 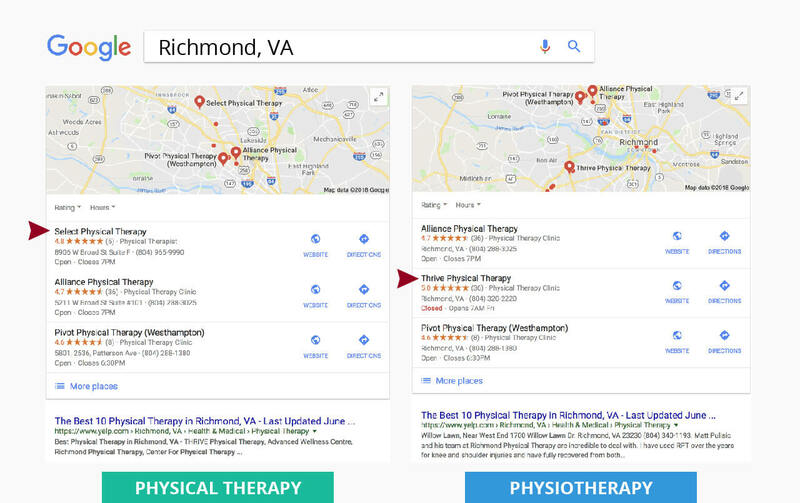 In fact, in this first example, you can see the highlighted words like “Rehabilitation,” “Physical Therapy,” and “Orthopedic” for both searches. Why? Because thankfully Google is very good at understanding what the user is actually looking for (thanks to their machine called RankBrain). Now, you may notice the top results here are different – we’ll get to that in a minute. Here are two examples of local results. As you can see, the order of the results varies but in both of these cities, only one result actually changes. 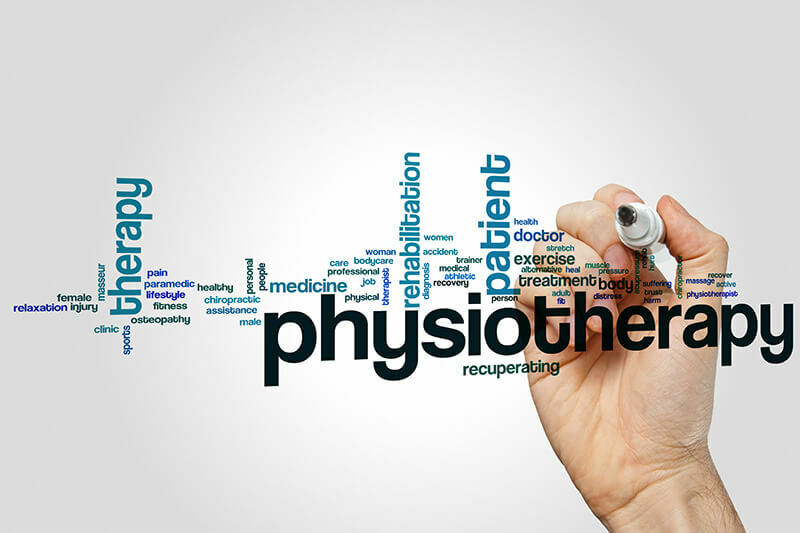 What’s more, none of the physio search results have physiotherapy in their name and their websites don’t appear to use the term physio in an obvious way. All that to say it’s unclear why the results change, but Google understands the two words are synonymous. PRO TIP: Check out the 1st result under each map. Yelp. Is your practice info on Yelp? Do you have reviews? It’s worth checking! It could get you higher on local searches without having to out-SEO your competition. If you need help, our websites come with tools to ensure listings on Yelp are prominent and kept up to date. Despite having the same technical definition, there is undoubtedly a public perception difference in the US. 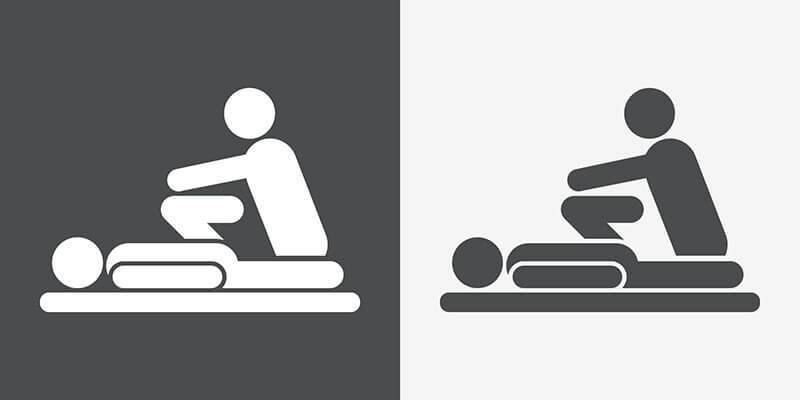 You may hear marketing claims that physio indicates a more hands-on approach. This is due primarily to the use of the term internationally. Manual therapy methods were much more popular overseas before making their way into American care. And because the rest of the world calls it Physiotherapy, the association was born. Don’t take for granted that some patients may have this perspective if it hasn’t been explained. Inform them, but be careful not to insult their intelligence. Here, the term physiotherapy is dominated by Australian Physiotherapy. They even beat out Yelp. The search term is in their company name, they appear to be doing SEO well, and they even focus on the international distinction to stand out amongst their competition. So in some local cases, physio marketing may make a difference. Is physiotherapy marketing different than physical therapy marketing? There will be select cases where marketing results may turn out different, but if you are using PT Marketing Best Practices then you can win no matter which term you use. As for Google searches, check out the difference in volume below. Over 95% of searches are for physical therapy. Physio even ranks lower than pain relief terms. So again, most of the time No – physio marketing will not be different. If you’ve been around for any amount of time, the small difference in these terms is not likely a reason to change your practice name & branding. You may be fighting some perception, but it can be overcome without a name change. If you’re looking to connect with people interested in physiotherapy, focus on ranking instead for manual therapy, hands-on, and sports rehab (assuming that applies) as well as basic conditions like Back Pain Relief. The audience is for these treatments is similar because of the modern, international, hands-on perception. Include a page on your site for these terms and add them to your homepage menus. You can also mention it in one of the headers or paragraphs in your homepage. 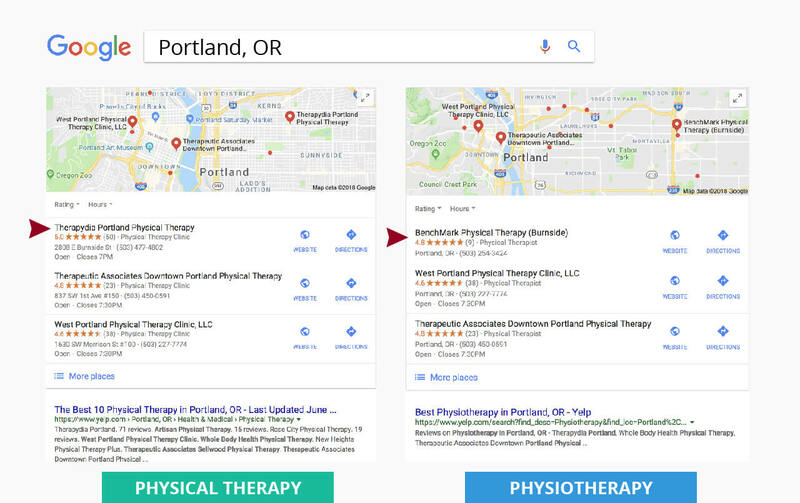 In most cities we searched where a Google result was different on “physiotherapy,” we couldn’t find that term on their site. They were, however, heavy with hands-on/sports terms and images plus built to be SEO friendly. If you do the basics right, you can win despite the difference in words. Simply explain the definitions of the term, but turn the attention to what problems therapy helps treat. Here’s a great example. PRO TIP: You can even attempt to rank for Google’s featured snippets (the highlighted answer boxes at the top of some searches). Do so by including the question “what is the difference between physiotherapy and physical therapy?” as a header in the post. Then, write a 50-55 word answer in the paragraph underneath. Should Your Practice Change Anything? If you aren’t feeling pain from specific competition, then don’t worry. The difference in terms will not hurt you. 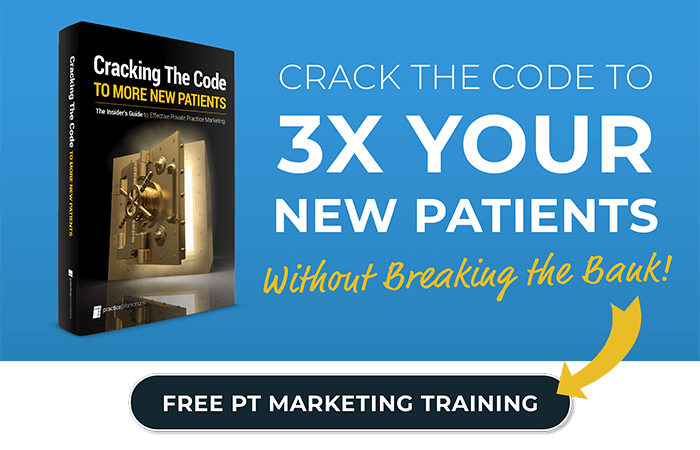 Use the same marketing best practices as always and your patient volume will come. If you do feel that perception or competition is hurting your practice, address it but not too drastically. Simply educate prospects through your blog or printed marketing. Lastly, keep your focus on your target audience not just your competition. If you market typically market a more hands-on therapy style, include pictures that communicate that better than words ever could. And if you need help advertising better or ranking higher in Google check here for more.